See them in person at our Open House April 12, 5–7pm in Berkeley, CA. All Power Labs is the global leader in small-scale gasification. We make biomass gasifier generators that are ready for everyday work, to serve real world distributed energy needs. Our Power Pallet and Powertainer are a new category of energy device. They combine the best usability features of diesel generators, with the clean running of typical renewables, with the potential for a carbon negative impact. Our project started in 2008 with the open source Gasifier Experimenter’s Kit (GEK), supporting research, education and DIY hacking in biomass thermal conversion. Seven years later the GEK has evolved into the Power Pallet, a full solution for commercial power generation via biomass. 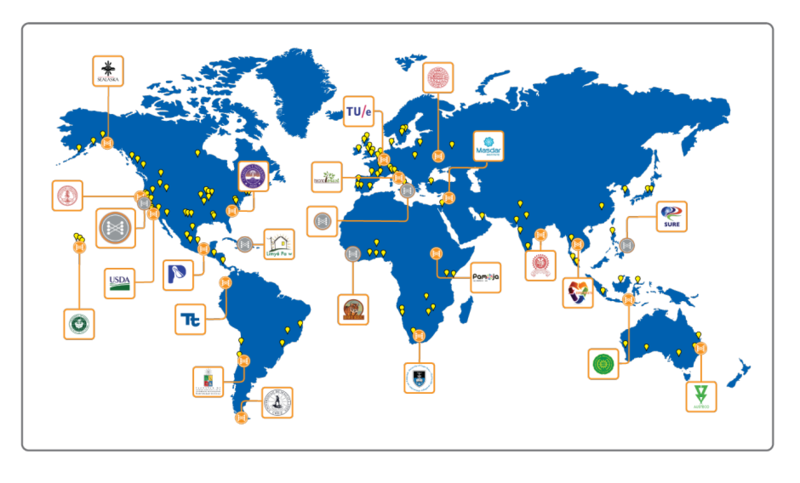 Today you can find our systems at work in dozens of countries around the world, and supporting research in over 50 universities. With APL products, you can generate on-demand power for 1/4 the operating cost of diesel, at 1/2 the capital cost of solar. And while saving money, you can shrink your carbon footprint and contribute positively to global efforts against climate change. The stakes in getting energy and climate right are daunting. The shear volume of carbon we’ve dug up from ancient reservoirs since industrialization and returned to contemporary circulation is difficult to get the mind around–we’ve collected some of the details here. So far we’ve mostly been able to ignore the consequences of this tomb robbing, as the temperature rise from CO2 accumulation lags by decades, if not centuries. The process of gasification is an incomplete one, and the leftover “waste” our equipment produces from making energy is a stable form of carbon known as ‘biochar.” Sequestering this carbon is what makes biomass gasification net carbon negative energy production. 1 tonne of dry biomass in produces about 1Mw/hr of electricity and 50kg of carbon byproduct. 1 tonne of biomass input to the gasifier can soil-sequester the equivalent of 0.185 CO2 tonnes in the atmosphere. Avoided CO2 emissions from not burning fossil fuel in the process are added to the wins above. Future APL machines will introduce features that enable increased biochar yield of up to 15-20% of input mass, while still co-generating electricity. For now we are just using the post hearth char. You can learn more about our carbon analysis here. You can also read fantastic coverage of the run up to COP21 in The Guardian. And for an extraordinary insider’s perspective, we’re really enjoying the blog Winning the Carbon War by Jeremy Leggett.